Ever since Adam Driver was officially cast in J.J. Abrams' Star Wars: The Force Awakens, fans have been eager to learn everything we can about his role in the franchise. Is he be part of the light side or the dark side? Is his character the son of Leia and Han Solo? After his character was identified as being Kylo Ren, a dangerous villain, allied with The First Order, a group inspired by the Empire, even more questions were raised. 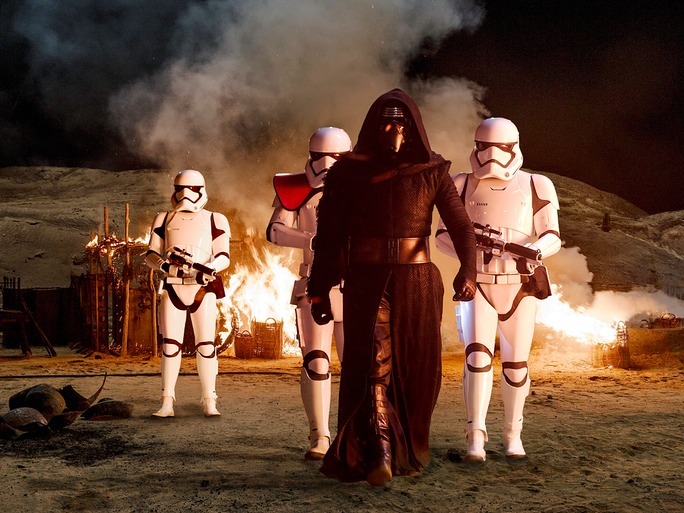 Now, with The Force Awakens' Dec. 18 release date fast approaching, Kylo Ren remains a mystery. But I think the most important question to ask in the face of limited character details is how many Star Wars movies Adam Driver's contract covers. Unfortunately, once again, we're in the dark. It's no surprise that details of Driver's Star Wars contract are hard to come by. After all, any information on how long Driver is expected to appear in the franchise might give away his character's fate. That said, even if Driver's Kylo Ren dies in The Force Awakens , it's unlikely his contract didn't contain clauses for potential sequels. When the new Star Wars film was announced, it was revealed to be the first of a new Star Wars trilogy, that would then launch a whole new universe of Star Wars films. It's unclear whether or not Disney has a specific plan for every potential Star Wars movie, so (and I'm purely speculating here) I'd bet that Driver signed on to participate in at least three Star Wars films, if not more. And, who knows, maybe Kylo Ren will even get his own spin-off franchise. But in case you're not as convinced as I am Driver will return to Star Wars after The Force Awakens, consider this: Kylo Ren has already introduced an iconic new piece of Star Wars mythology via his much-discussed cross lightsaber, and Abrams has confirmed that audiences will learn about the lightsaber's origin and the origin of Kylo Ren's mask. Abrams teased that Kylo Ren's backstory will be something explored in The Force Awakens, telling EW, "He is a character who came to the name Kylo Ren when he joined a group called the Knights of Ren." Why give Star Wars fans such an important character and tease his backstory just to take him away after one film? It's also worth noting that co-writer Lawrence Kasdan, who also wrote The Empire Strikes Back and Return of the Jedi, told audiences at the recent Star Wars: The Force Awakens press conference that Kylo Ren was one of the most unique characters to ever grace the Star Wars universe. "He doesn't have his sh*t all together. You're getting all the contradictions and conflicts that people feel. That's what's unique about what Adam has done," Kasdan said. Also revealed at the press conference was news that the cast would be returning to England to begin work on Episode VIII in January, though no actors were named specifically. Whether or not Driver stays with the Star Wars franchise remains covered in secrecy, not unlike everything else Star Wars related. But, if I had to put money on it, I'd bet on Driver reprising his role as Kylo Ren in the near future.